I went to a technical lecture tonight that got my juices flowing. It dealt with modelling programs which model other programs, ad infinitum (the subject was model drive architecture and the eclipse modeling framework). Another term that is used is meta-models, and meta-meta-models, etc. I did similar work over 10 years ago, but I never followed-up on it once the project ended. I tend to do that. I start something that interests me, but then I give up on it. Later I come to recognize that the field has caught up and then surpassed me. Back then I built a program that modeled programs and then I built a transformation system that would input one model and output another. So a programmer doesn’t write code, but instead write a transformer which indirectly write code. Naturally, one can build a lattice of transformers where transformers can be modelled and transformed too. All very recursive and self-referential. And it’s only in the last 3-4 years that people have been publishing and writing books on it. I tried to write a paper on what I did back then and when I submitted it to a small internal conference it was rejected, and so I gave up and I went on to other things. I just don’t have that single minded determination. I wasn’t very good at proposing. We had carried on a long distance relationship for over four years. Either I was in college and Kathy was at home, we were both in college, or Kathy was in college and I was working. We wrote often and spoke on the phone when we could. We would see each other on holidays, and vacations. The summer before I proposed we spent together in Poughkeepsie, New York, where I worked. I was living with two roommates, Roger and Bill, in a three-bedroom apartment. That summer we lived all together with us sharing a room. At the end of the summer Kathy and I travelled to Maine to be with her family on vacation. We had been so close, but during that time I definitely felt Kathy was distant – later I learned that she had expected me to proposed to her. After the summer she went back at college, and I was working. We continued to write letters with a phone call on the weekend. On one of those calls I asked her to marry me. Her response was “Are you kidding?” My response was “Nope.” I was serious. So the next weekend I asked again, and finally on the third weekend call, she said, “You’re really serious.” At which time she said yes. If I had to do it again, I wouldn’t propose that way. Not very romantic, not a surprise, not in person, no candlelight, no bended knee, no ring, no tears. I wasn’t very good at proposing. 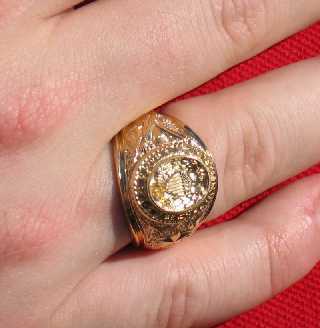 I took a half-day vacation, and went and saw Matthew get his Texas A&M ring today. This a big deal, because you can only get it after completing sufficient credit hours of hard class work. The ring looks real good on his finger. It’s nice and sparkly. We shared these good times with Gwen and Amber and her parents and brother who are friends he’s had since freshman orientation years ago. Before getting his ring I went to the HelpLine and met his boss, Susan, and co-volunteer, Jesse. After getting his ring we had dinner at Jason’s Deli, talked and then I got to see him play softball. Where oh where does he get such good hand-eye coordination to hit the ball like that? And what was great was they won. I think that makes two games so far. He had a double-header, but it was getting late and I had to leave after the first game. I got back home at 11 PM tired but happy. It was a nice break for a Thursday. I’m glad I did it. On an I35 billboard nearby to my favorite burrito restaurant: “Driving six hours for a burrito is nothing, when you are in love” signed by someone in San Antonio. Over the years I’ve found that I never go back. For example, when I left home for college I only returned for vacations. Instead I worked each summer at college or as a co-operative intern. At work, I’ve considered returning to a previous department, but somehow I like to do new things and have never returned to one. When I retire will I ever work again? So I don’t know if I’ll ever break this trend, but if I do then that’ll be a new thing for me. Now is that going back or is that going forward? I just bought this lovely little light Canon A310 digital camera. I was proud as punch to be able to afford it. Now it seems to be having intermittent problems. For example, two times in the past week I’ve tried to power it on and it just won’t. I pushed the buttons, open the shutter door, and nothing lights up. Bad luck. In both cases I’ve been downtown at running practice and I have wanted to take a picture of my coaches. I tried to power it on and nothing happened – nada – kaput. Then I brought it home, put it on my dresser and the next day I try it and ta-da, it works. This has happened to me twice so far. Today I decided to leave it in my car all day to see if it was the heat. Just now I went out to the car, tried it, and it worked. Hmmm. Now this is starting to bother me. I’m getting real close to sending it back and trying to get another one, but when I send it in I have to describe the problem and that’s a problem, because it’s intermittent. Naturally when the repair people get it, I’m sure it’s going to work, and they’ll send me back the same lovely little light Canon A310 digital camera. Ugh. At work we’ve been having this intermittent problem. It’s a hang where the task seems to run, and never end. Thus causes the entire job to not complete. We see it when some machine is de-provisioned, that is, when the software is uninstalled and the machine is put back into the available resource pool, but the task hangs on some other machine when it tries to terminate. Naturally this happens several hours into a job so we’ve had a hard time trying to capture it. Well today we caught the hang while a job was running. Then by chance I looked at the task in the grid scheduler and it show that the hung task had been running on the de-provisioned machine, but when the machine was de-provisioned, which kills the task it was running, the grid scheduler rescheduled it onto the machine where it got stuck. So it just wasn’t any other task that was hanging, but the same one, the rescheduled one. This was key! Knowing this I postulated that there was something left in the shared file system which causes it to hang when the task restarts. As a result I have suggested that we delete all the temporary, work and output files when the application starts, therefore, when it is rescheduled it will appears to be a “fresh” execution. Let’s hope this works. Dennis will make the changes and try it tonight. I’ll find out tomorrow. Anyway I was happy to have figured this out with Jonathan because this problem has been bugging us for weeks. Maybe, just maybe, I earned my salary today. Update: I found another problem that could cause a hang today. When executing a command under Java you create a process object. The process provides a mechanism to feed it input, and get its output and error. My present code reads the input in the current thread which can caused the hang, whereas, I needed to create a separate thread to do this reading. I saw a second movie this weekend, Resident Evil: Apocalypse. I have always liked Milla Jovovich after seeing her in the Fifth Element. It was ok, but nothing really scared me. IMHO, the zombies were pathetic. Was it the movie or just I’m getting too old for this sort of stuff. Yet I was surprised to see parents bringing little kids to see it. At that age I would have had permanent psychosis. Hmmm, maybe that is why I’m the way I am. My brother took me to see the 4D Man, and I remember keeping my eyes closed the whole thing. Yup, that was it. Again I continue to watch Big Brother 5, and Amazing Race 5. I so much enjoyed the pushy AR5 leaders, Colin & Christie, get their comeuppance when one of the other teams delayed them on purpose. Then they self-destructed. I was talking back to the TV, yelling, and clapping. Woohoo, this one is getting to me. My adrenaline is pumping and it’s just a stupid TV program. But I love it, I just totally love it. You are currently browsing the Watt's Up blog archives for September, 2004.